Our state is now a third of the way through fiscal year 2015 and revenue collections are far below last year’s pace, as reported today. Mid-fiscal year budget cuts are ahead! Education and other key state services are in peril! Expenses in the legislature's approved FY 2015 budget total $6.325 billion. The state began FY 2015 with a reserve balance of $380 million. But even after draining that reserve, the state would have to collect $5.945 billion just to stay above zero. Is Kansas on track to collect that much? Not at all. In all of the last fiscal year, revenue totaled only $5.653 billion — and that was a drop of $688 million from FY 2013. If FY 2015 revenue were to just stay even with FY 2014 — and that's a big 'if' — the state still would have to cut expenses $292 million before this fiscal year is over. But FY 2015 revenue is not even keeping pace with last year — it’s falling, as today's report shows. Meanwhile, unavoidable costs are rising: expenses for Medicaid, the retirement system, education, and other public services — yet more income tax rate reductions are scheduled for each year until 2018. The math simply doesn’t work. 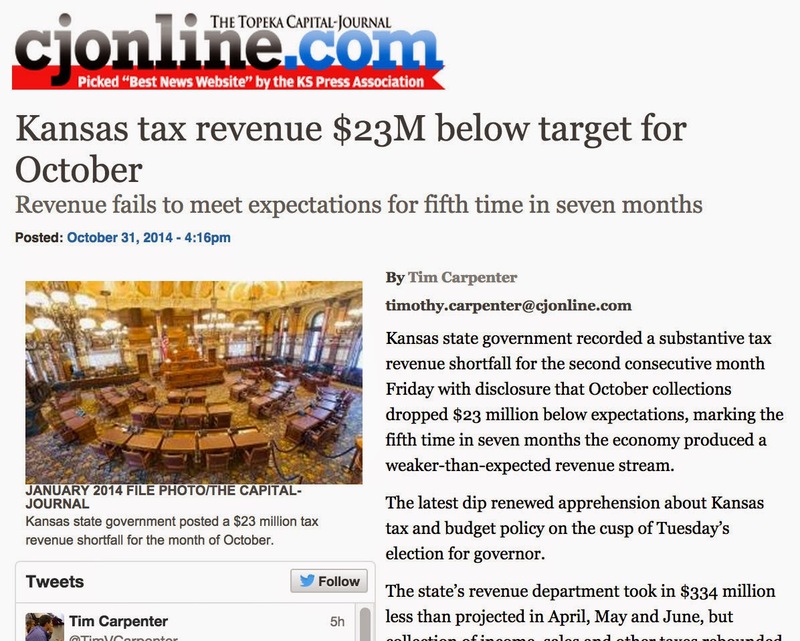 The state budget is crashing, and the Brownback administration pretends not to notice. The administration's election campaign message is to stay the course! Don’t look away, Kansans. Take notice, and change course! So, What’s On The Kansas Budget Chopping Block?